Discovery Center open Mon. - Fri. 8 am - 5 pm. After hours, someone is available to assist you! Dover Bay - A complete, new residential waterfront resort community on the shores of beautiful Lake Pend Oreille, just 3.5 miles west of downtown Sandpoint, Idaho, and a short drive to Schweitzer Mountain Resort. A visionary planned real estate development with almost 2 miles of lakefront that enhances and preserves the natural beauty of the area. 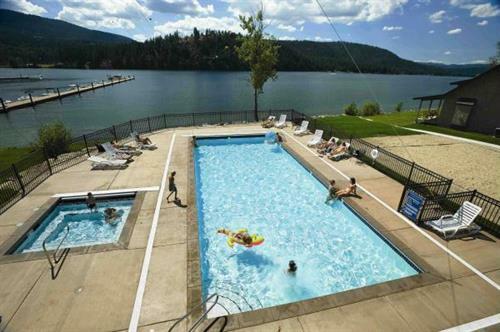 A four-season recreational lifestyle and relaxed pace in this pristine, lake-and-mountain setting in North Idaho. The Marina Village at the heart of the community includes marina, beach bungalow vacation rentals, fitness center, cafe and market. Only 3 miles west of downtown Sandpoint on HWY 2. From Spokane, take I-90 east to Coeur d'Alene, take Exit 12N, and drive north on HWY 95 to Sandpoint. Then drive 1.5 miles west on HWY 2 to Dover.